The FKS process and temperature controller. ERO Australia has introduced a new low cost FKS process and temperature controller. The compact panel mounting model FKS [1/32 DIN (24 x 48mm)] uses advanced PID algorithms to provide stable 'straight line' temperature control. Advanced functions such as soft start, allow for gradual warm up during the critical start up phase, provided via automatic power limitation parameters which are configurable for specified periods of time. A universal input allows for inputs such as thermocouple (J, K, T, L, N, R and S) plus Pt100 and mV process inputs, allowing for inputs such as 4-20mA via terminal shunts. This allows the one instrument to be used for all standard temperature and process inputs. Universal power supply options of 100 to 240V ac or 24V ac/dc allows the FKS to be used with power supplies worldwide. Two outputs are configurable for heating, cooling or alarm functions, which are set via front accessible tactile buttons ensuring positive operation. 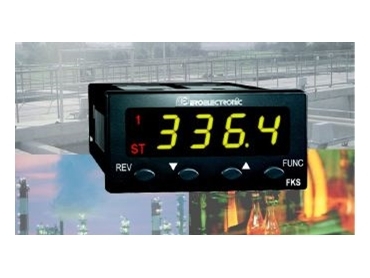 The FKS outputs can be setup for either control or alarming. Used as alarms, the outputs can be configured to activate as high, low band or deviation alarms, with adjustable deadband. An IP65 rated sealing allows the FKS to be installed into harsh industrial environments. The 4 digit display and 4 function button user interface combined with simple setup procedures allows for fast commissioning, with auto-tune provided as standard for loop optimisation. The simple menu for the FKS provides a convenient and exact method for setting parameters such as new input calibrations, without the need for simulators and sources. The cost-effective, simple-to-use FKS controller provides an ideal process control solutions for applications such as simple heating and cooling, small ovens, chillers, sterilisers, trace heating, heat sealing and injection moulding.